A few generations ago, an actor stated, the map was filled with green vegetation. At the time the play was set, there was very little left. Although the environment was key to the play’s themes, the drama could easily have been set in parts of Canada in modern times. The characters, apart from the costumes, seemed as if they had just emerged from a rural Ontario farm house. Their anger at the encroachment of civilization, their worry about how they would financially survive, their inability to protect their culture and way of life, is entirely 21st century Canadian. The emotional play’s dilemmas and situations are timeless. Sue LePage’s earthy, beige-toned set created the ambiance of a dense wood. Rebecca Picherack’s soft, intimate lighting enhanced the impression of sun peering down through the leaves. Paul Sportelli’s original score added a touch of immediacy to the surroundings. The audience was immediately taken into the atmosphere of the play. All the performers were believable and engaged. Together they wove a spell over the audience, enticing the viewers into the complex feelings and situations on stage. Especially compelling was Sharry Flett as Marina, David Schurmann as Serebryakov, with Marla McLean portraying Sonya. The unrequited love of Sonya for the doctor, Astrov, played by Patrick McManus, was the emotional centre of the piece. Her longing filled the stage, and her frustration was palpable. She had what he needed, but he couldn’t see it, and he wanted what he couldn’t have. Welcome to Chekhov’s world- where the plot is less important than the emotional arch of the characters. What happens is personal transformation and enlightenment – not overt actions – even if it comes at an extremely slow pace. Russia, at the time Chekhov wrote the drama, was about to go through an immense social upheaval, and that is evident in Uncle Vanya. Revolution is waiting in the wings. Things cannot continue on the same way. Impending revolt is visible in the tension and frustration in the characters, so aptly captured by Maxwell. Chekhov has captured a moment – a powerful period in history that has much to teach us. 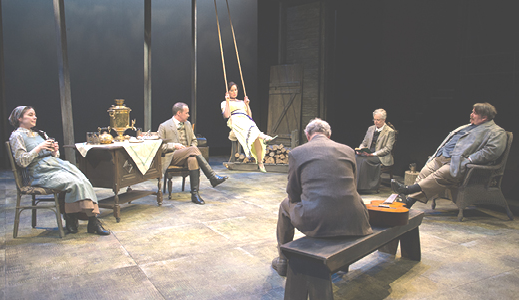 Uncle Vanya is playing at the Court House Theatre in Niagara on the Lake until September 11th.